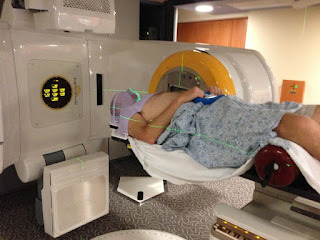 Back on June 6 I had a radiation treatment planning session where they made the mask that holds my head and shoulders still, and also took CT scans from which Dr. Rad and colleagues could precisely outline the tumors and plan the radiation doses and locations. The CT data is registered with the mask so they know at each treatment the radiation will be delivered exactly where they want it. Wednesday this week I had a radiation treatment dry run. The planning session was performed at the Brigham and Womens Hospital across the street in a normal CT machine. The dry run was performed at Dana Farber in the actual machine that will deliver my treatments. Dana Farber has three Intensity-modulated Radiotherapy machines. They have colors for names. All of my treatments will be delivered by the Green machine. Each machine has a dedicated technician crew (a crew of three) and they become familiar with each patient's plan. That helps prevent errors. During the dry run they took more X-ray images to confirm the mask/machine alignment, then they ran through the treatment program without emitting radiation to get visual confirmation that the sequence was properly programmed. This type of therapy involves radiating the tumors from multiple directions in order to reach all areas of it. The multiple angles also allow the radiation to avoid nearby anatomical structures that should not be irradiated if possible - they don't want to cause damage to normal tissues if at all avoidable. That entire structure you see in the photo rotates 360 degrees. And the table also moves to put me at different angles to the beam. During my treatment the machine and I are sequentially moved to multiple different positions. Then I basically get an X-ray at each position, but unlike a diagnostic X-rays these are focused and also significantly longer exposure (the buzzing goes on longer). The green lines in the photo are alignment guides that the technicians line up with marks on the mask. The red tube under my knees is just for comfort. As is the blue ring I'm hanging onto - so my arms don't flop down beside the table. Apparently most people find the mask pretty claustrophobic but I don't mind it. I find it kind of comforting. Wonderful Wife says perhaps it's like swaddling to a baby. When I told the technician I could almost fall asleep in it, they said that was the first time they'd ever heard that. I may ask for one minor adjustment - the mask has shrunk a little and yesterday I could not even open my eyes. Yesterday was my first real treatment. I met with Dr. Rad beforehand and she and Nurse Susan set my expectations. They said I shouldn't notice much effect from the radiation treatment for perhaps the first two weeks with the exception of maybe some mouth dryness. They of course have mitigating strategies for that: a homemade rinse containing salt and baking soda in water is the first thing I'll use. My mouth will start to slough off dead cells and the rinse will help both keep my mouth clean and also rinse out that debris. Only 34 more radiation treatments to go. Monday through Friday until August 8th. I get July 4th off. "The mask has shrunk a little..." or, "I have been indulging like there's no (taste) tomorrow.